Discussion in 'Leaving Scientology' started by SHUKex, Jun 12, 2018. There’s probably very little on this site I disagree with. I lived it for a long time - pretty much making my way to ‘the top’ in processing and training. SHSBC, etc. Was also on staff for years, but not in the SO. But I worked alongside them and saw the happenings. For quite a while I walked around with a permanent grey rag tucked in my pocket, ready for my next ‘liability’ assignment. That was an automatic assigned condition when I was procuring staff and specific staff post were unfilled. Yes, interesting days - and nights sleeping on a camp bed and sneaking into the dreaded Herbie Parkhouse’s office in the GO for an early morning shower! Oops! Not allowed. I slipped away quietly from Sc. and was not declared SP. I left during the time of the mass walk out of many old timers right across the planet. Maybe newer people don’t know that happened I wonder how many have wondered the real reason for that walk out - beyond the fact of us being fed up with rising costs of services and getting piles of yellow ethics orders dumped on our desk daily to see who we weren’t allowed to speak to anymore! I’m going to express a different view of Scientology. Many will think I’ve lost the plot!! That is OK. Go for it. I don’t mind. Look how often we enthusiastically told friends and family about Scientology - and they were totally convinced we’d lost the plot and needed serious help. I’ll say it anyway and maybe it will help someone see it all from a higher perspective of truth. I know it’s hard to see another view while we’re still stuck in the pain of the ‘story’. But that story is a limited picture and just a 3D perspective. However, that 3D story really needed to be told and a million thanks to all those ex’s who spoke out to the media, wrote books, etc. Their courage assisted greatly to bring up to the surface, trauma to be released. When I left Sc, I took time (as many did) to reassess it all. I am so glad I really worked at that. It served me well for my future path. I did my best to let go of any negative emotions about the tough times; to handle the major loss I felt of the group dynamic (I’m sure most of us long termers had); and to work on holding strong and reinforcing all the spiritual gains I’d had, which were many. I felt much of that gain was due to the deeper understanding gained from taking the training route - SHSBC etc. I then used all I’d gained in Scio to act as a springboard so as to keep growing spiritually, seeking out where the universe led me onto other paths to gain further understanding. I just read the post by wogwog about what got them in and out of Scientology. An amazing insight and very clever. I can pretty much agree with most of that. But, it’s viewed only from a 3D perspective. You may say how else can it be viewed? So, here I go. The start of another story, but it’s a different story. Not as ‘way out’ as the Xenu saga maybe!! But it’s my truth. 1. We are multi dimensional beings in a multi dimensional universe which means there are consequently many different levels of truth. There’s the limited 3D view (the obvious one) and then there are higher dimensional reasons for everything that occurs in each of our lives and in all events on Earth. Sometimes we can see the higher reason, but mostly not. Luckily, we don’t need to see it, because the learning we obtain comes from the way we choose to handle the experiences we encounter. 2. The Earth is continually evolving, as are we. 3. Millions of us incarnated here, as early as Lemuria and Atlantis, to assist the evolvement of Earth birthing into a higher frequency of light. We came here from other planets and systems. Does anyone still believe life only exists on Earth? Out of this entire vast universe? Hopefully, many are now past that limited idea. 4. For all of us, having spent many lifetimes accruing and often burying all sorts of heavy energy traumatic experiences in the ‘reactive mind’ (to use a Scio term), we arrive at our current lifetime - our ‘wrap up lifetime’ - all destined and planned, the last before returning home. Additionally, for all the Old Souls here, it is their last ever incarnation in any 3rd dimension. There will no longer be a need for them to bring their experience and help to a 3D incarnated world. After this run on Earth, all information gained will be slotted into the Akashic records for others to learn from. I won’t go into that. Just trying to keep it to a minimum. 5. Fact. In order to return home at the end of this incarnation, we need to be vibrating at a certain frequency of light. Any dense energy sitting in the various subtle bodies we each have (mental, emotional, etc.) prevents this and so it needs to be released. 6. Various technologies were pre-planned (from a higher perspective), to come into being in this incarnation, to assist the releasing of any dense energy buried from previous incarnations of all those who came to help the Earth on this Divine Plan! 7. Scientology and especially Dianetics was one of the major technologies planned to achieve this - to be overseered by LRH. It works if held precise mathematically correct. It did exactly what it was designed to do. It released engrams and trauma by the ton. It also helped us remember we were more than ‘a body’ and were actually a spiritual being. 8. In the higher plan, sufficient time being in Scio was allowed - enough time to help us release as much past life trauma stuff as possible. We didn’t need to get rid of it all, just the bulk of it, to give us a good kick star. Then, more time was allowed; 5 years was the estimate that most of us would need to get over it all; go beyond any negative aspects of our Scio experience; disorientation; disillusionment; time to get ‘out of the head’ from being in this very analytical scientific subject and get ‘into the heart’; to realign to unconditional love and get over the loss of the group dynamic/bridge, many had. The overall goal was to get ourselves in a clearer space, more balanced and ready to carry out the role each of us chose to do to this lifetime. For many it took the 5 years to get over it and prepare for what lay ahead (our actual work on Earth). Of course, there’s always a choice. We can sit in blame and regret and be a victim or we can act as a creator and master of our life, grasp it and move forward. There are 4 flows to an engrams! 9. There were many universal signs put into play to trigger us to leave Scio - e.g. ethics orders gone mad declaring everyone and his mother an SP and being told we had to disconnect! Some did disconnect for a while (fear! ), but then for many the clincher came and it was our best friend - and it was ‘no way! Lots of other signs including the mass worldwide walk out. 10. So, that’s my understanding of the higher reason for Scientology and Dianetics. LRH did a great job actually, but I don’t expect that is easy for some to believe. I’m eternally grateful to him. He allowed me to receive a technology that released heaps of dense energy and allowed me to move. I have enjoyed a great life, understanding more of the perfection of the universe has made me grateful for every part of my life. We go on ever learning and growing and helping others. Isn’t that why we are all here? Everyone is helping everyone else. Obviously, this is a limited description of one aspect of a very large universal picture, but it is simple (truth always is) and hopefully is enough for those who choose to go within for their own truth. We can all reach that place of inner knowing, if we let go and listen. See you at the banquet on the way home! It can be quite interesting to read the opinions of others regarding the cult, life, death and the 'universal picture' ... but that's all they are (unless something more is provided) and you seem to have made quite a lot of (negative?) assumptions about the people around here. Anyway, I expect your intentions are good ... so, thanks for the lecture and welcome to ESMB. PS It took me about 3 minutes to 'get over' scientology ... it was the loss of my family that almost broke me, but I do not see myself as a victim (thank you). I see myself as a once gullible (but very young) silly arse that got involved in a mad cult ... who then got out and went on to live a very happy and fulfilled life. PS It took me about 3 minutes to 'get over' scientology ... it was the loss of my family that almost broke me, but I do not see myself as a victim (thank you). I see myself as a once gullible (but very young) silly arse that got involved in a mad cult ... and then got out. I do apologize if any of it came across as negative assumptions. That was certainly not my intention. Just trying to include anyone wo has found it hard to let go. I have quite the opposite view of ex Scientologists actually - as being pretty smart. I 'm talking about the many who came here to help the planet from higher dimensions using Scientology to help clear unwanted stuff and then getting out of Scio and proceeding to do good works (whatever that work may be). Maybe not well explained. Sorry. Multi dimensional beings in an amazing multi dimensional universe. If you're using Herbie's shower I'm guessing this is at Saint Hill, and this "mass walk out" is around the time the SO started coming off the ships and implementing heavy ethics in the orgs late 60s -early 70s. There have been a lot of mass walk outs. A lot of people left after the RPF purges in the late 70s, then the 83 Mission Holder's Conference, The Hole and Debbie Cook's email debacle, Anonymous, GAT, IAS fleecings. Even before all this the Dianetics vs Scientology split. Surprising there's anyone left to walk out. For a $cientologist or ex-$cientologist that's a lot of new age-y stuff in your story. Just sayin...... Atlantis, Lemuria, etc. Would you have gotten into trouble for having those ideas if you ever mentioned them while "in"? Did you ever? Unlike most books about Scientology, 'Messiah or Madman?' examines both the "positives" and "negatives" of the subject. Part of its purpose was to inoculate others from the tricks and abuses of Scientology. consistently in my way make me nervous. his first wife in 1938.
profitable of the money-making new religions. the founder of General Semantics, Alfred Korzybski. And P.T. Barnum appears to have been an inspiration. is determined to achieve broad public acceptance. sued, lied to or destroyed." navy, and began to refer to himself as "Source." You say that Scientology and Dianetics did exactly what it was designed to do, releasing engrams and trauma. And later in your post you say that "LRH did a great job actually". The organizations created by LRH caused trauma in so many of their members, as documented here on this forum and elsewhere. And that is the opposite of what you say Scn and Dianetics were designed to do, so I'm not sure how you can say that LRH did a great job. I'm happy to encourage anyone to think about their life experiences and share them, so thanks for the shout out. I must admit I feel like all the talk about "light wave frequencies," Atlantis, incarnations, etc. are just more new age nonsense without a basis in reality. In fact, when I was still a Scientologist, it was reading the skeptical criticisms of those sort of beliefs from other new age groups/cults that made me start questioning LRH, who borrowed and stole from so many of them. At this point, it's safe to say engrams do not exist in any way like LRH described, and that Dianetics and Scientology do not treat the real lasting effects of trauma any better than talking about it in psychotherapy, and in many cases are worse for you. I say this after quiet enjoying auditing, but I did not have much real trauma in my life and was considered a pretty easy pc. But you believing in fanciful stuff like that doesn't bother me since you seem chill about it and you're (hopefully) not starting a cult to sell your teachings to others. Yep SH UK. I knew there were some but hadn't realized there were so many other big walkouts. Thank you for telling me that. Clever, aren't we? We know when its time to go. Yes, I know it caused many people a lot of grief during their time in Sc. Not pleasant but at least it is this lifetime and so being aware of it, are more likely to be able to handle it. I am referring to the myriad of past life stuff stuff that was able to be addressed which I feel it was designed to do. Ha, no I cant imagine how that would have gone down. We were not even permitted to see a chiropractor without permission. I had no idea of the existence of such things when I was in Scientology. As mentioned ,after I left I moved onto many paths and began to grasp - through experience (not belief) a better understanding of how it all works. I don't expect there is ever an end to that learning, do you? We all just do the best we can. Which exodus of old timers are you talking about? Also you said "onto many paths and began to grasp - through experience (not belief) a better understanding of how it all works. " To what degree did 'education and what form such as reading, listening or through videos and or discussion with the many members play a role? I assume there must of been some of that before and or while your grasping by experience. Do you care to expound on any of that? Ha, no not starting anything. Heaven forbid tying up energy in new teachings. And of course there are no new teachings anyway. I not a great believer in things and prefer to experience things for myself before I pass on anything. I am not sure why light wave frequencies are deemed to be new age. Light waves are surely around us all the time - radio, TV, etc. I think we are saturated with the variety. And we have Plato referring to Atlantis, so that's been around a while as well. Each person has their own experiences and we can only base our truth on that. For me - engrams worked precisely as per the tech and I had major permanent benefits from that. And for myself, great benefit is gained if I can compartment incidents into a reality based on previous incarnations. There are many realities and many illusions. We can use what is useful to achieve a result fort us, without buying into the idea it is therefore an absolute universal truth and fixed in concrete. Personally, I have no objection if LRH stole from other philosophies, pretty much the same as I have no objection to Bill Gates (or Steve Jobs) doing the same sort of thing to achieve a result to help many - as long as people are not damaged in that process. Oh, I was just hitting the highlights. Then there are the Inflation price increases, the beans and rice staff austerity programs, the Time article "The Thriving Cult of Greed and Power", the Tampa Bay Times "Inside Scientology" investigation, The Basics crush regging marathon. What's really amazing about all of these is the GO and OSA were supposed to have had this all under control but the books, documentaries and life stories keep coming out. Scientologists just aren't supposed to know or think about any of this stuff. Scientology was designed to exist in an information bubble. The bubble is gone and it's never coming back and they are absolutely incapable of evolving. OK, so maybe I digress but it is fascinating to watch the most capable people on earth unable to grasp such an obvious and severe reality adjustment. So OK, I've pretty much sworn off the woo, but there is kind of an unspoken understanding that we be nice to newbies so I pulled my quivering finger away from the "Poop" button but I remember seeing some Sea Org members in the late 70s write to LRH on the SO 1 Line about all this esoteric stuff, pyramids, UFOs, Atlantis, etc. and the responses were very understanding - along the lines of, keep making progress on the Bridge and the answers will become clear. I know, it wasn't really LRH answering those letters but still. If you think about it, this is pretty much Scientology's entry level public. "Have You Lived Before This Life", "History of Man", these high octane injections of woo are bookstore items available for raw public right off the street. If they didn't want walk-ins who weren't into this then it would be tucked away only to be released on some higher level when they knew they were on board with alien past lives n stuff enough to accept it. We shouldn't be surprised that there are going to be exes out there who are still into this. People don't just get into the esoteric because they get into Scientology - they get into Scientology because they are into the esoteric and recognize them as kindred spirits. Unfortunately, that makes them prey to the scam. The main reason I post here is I don't want to see other people go down that road and I used to be very much like that. I love Sci-Fi and I have an active imagination. I believe many things are possible but these same things can make people extremely vulnerable to manipulation. In a world saturated with fantasy and CGI - there is good reason we see them proselytizing at Comic-Con. Yep. In my experience if Hubbard has weighed in on something no matter how ridiculous THAT is the opinion/belief of $cientologists. I imagine certain $cilons smoked Kool's cuz that's what the Fatman smoked. Or if he said jelly donuts are bad and only glazed are good then that would be the $cilon way of life concerning donuts. Nutty. That would be in the 70’s. Aside from what we saw what was happening at Saint Hill, we heard of key names leaving in the USA. It had an impact on us. More of us started leaving. As you know, not a lot of what was really going on in the US, especially with the SO and the goings on with the ship, filtered through to the UK. Over the next couple of years, there was a lot of mutual support going on among ex members. Just discussing it with each other helped a lot with our releasing and readjustment. Personally, being quite a positive person, as I came to terms with the changes - I was determined to extract all the good from it and put it to use. One solution to disentangle myself was to let go of ‘beliefs’ and hold on to what I knew to be true. Knowledge of things I’d personally found workable, such as the Scales, I hung onto. I’d had many spiritual experiences while in Scientology that were now so deeply a part of my soul they’d become a strong and undeniable basis that gave courage to step forward. I knew wherever I went, no matter what happened, I‘d never fall lower than that bedrock stable point of knowing. I knew I was a spiritual being able to move around the universe with all senses (visio, hearing, etc.) without the body- because it had happened. I knew the truth was there was only a ‘now’ moment - because the time track disappeared and I only had ‘now’. I saw the difference in vibration between the dimensions because I had experienced 3D becoming transparent. I had conditions disappear after viewing relative past life incidents concerning that - so I knew that viewing something as a past incarnation worked, regardless of whether ‘past lives’ turned out to be a truth or simply part of some illusion. It worked. Upon review, I saw how much we were encouraged to stay in control - to make things go right. And how much I had agreed to that and it had taken me miles away from much of the heart felt compassion, love and tolerance we all seek. I knew I had to get closer to that space as best I could, understanding that a major key to a true spiritual path seemed to require a surrender to the natural flow of the universe. I could see I was far from that. So, that took me a while to handle!! I made a choice to try my best to get my answers straight from the universe; to only accept what I personally experienced; to watch for life’s signs and to tap into to whatever level of consciousness was out there that could give me a greater overall grasp of what it was about. So, after Scio ended, my personal choice was not to read much at all. I read a few things here and there. Bach Flowers to clear the auric field. Stuart Wilde The Force and The Quickening but not much moire. No videos, lectures, courses, etc. Instead, I practised surrendering in each moment and staying balanced and grounded so that I was present enough to see the signs I was offered. So, I stepped off the cliff - trusting I had a good basis with which to move ahead to explore. What a journey lay ahead. I continue to be grateful for every tiny experience, the gifts of beauty we have all around us every moment if we look and every person I have met along the way, regardless of the lesson they offered. It seems that, when people leave the Official Scientology, they can go in two directions. One is to start discarding the crazy, unworkable, destructive parts and the other is to go farther, building off of Ron's mythicism -- as in Captain Bill. You have gone the direction of building a more elaborate mythology -- and I must admit it is quite creative. Would you describe 5 gains that a being might consider spiritual? People have been leaving the CofS since 1954 when Scientology was incorporated as a Church. Before that, people left Dianetics, some of the better remembered are J.A. Winter (who wrote the Introduction for 'DMSMH'), and John Campbell (who published the first article on Dianetics in his 'Astounding Science Fiction' magazine). They left in 1950 and 1951. Then came the transition to Scientology, after Hubbard lost the rights to the name 'Dianetics', and decided to drive former business partner, supporter and benefactor, Don Purcell (A Dianeticist who rejected the idea of past lives), bonkers by concocting - pretty much overnight - "Whole Track Maps," and then the book 'History of Man' ("This is a cold blooded and factual account of your last sixty trillion years.") And more left. Richard DeMille, an early book transcriber, who also wrote some pieces now attributed to Hubbard, left around 1953. 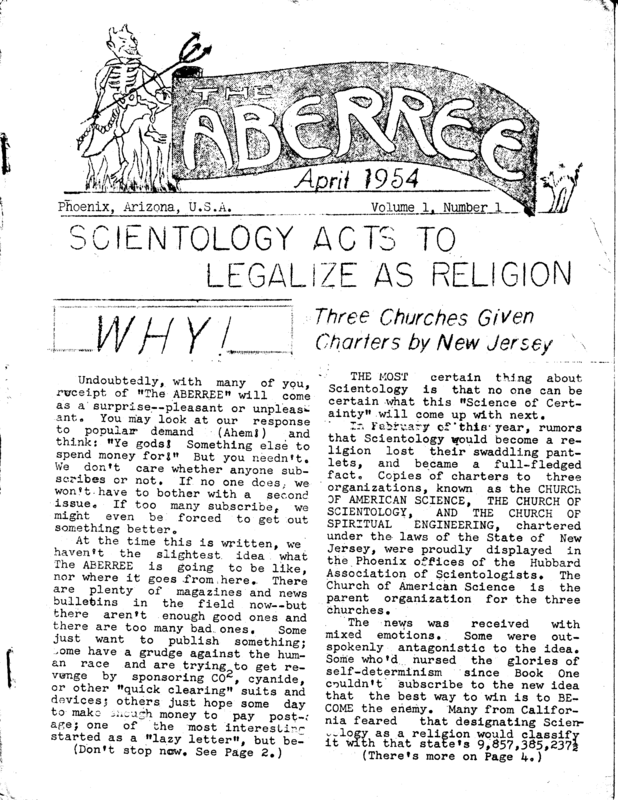 Around 1954, Hubbard, applying his "religion angle," wrote a for-display-to-Raw-Meat&Homo-Saps&Wogs 'Creed', and made Scientology a "Church," and more left. In 1959, L. Ron Hubbard Jr. left. Lots of people left in the early 1960s with the era of 'Security Checking', deciding that any group that insists that its members undergo metered interrogation, with such questions as "Have you ever had any unkind thoughts about L. Ron Hubbard?" was not for them. By 1965, Hubbard wrote 'Keeping Scientology Working', invented the SP Doctrine and SP Declares, Disconnection, the Fair Game Law, and the very confidential, "deadly serious," and vital to your survival, history of the universe&your mind (now confidential), and starting calling himself 'Source', and many more people left. In 1967 came the Sea Org and Xenu, and more left. By the late 1960s and early 1970s, the Commodore and his ashtray-carrying 13 year old girl servants were a law unto themselves on the 'Flagship', the "safest and sanest place in the universe," and more left. John McMaster, 'The World's First Real Clear' and the 'Pope' of Scientology, left. 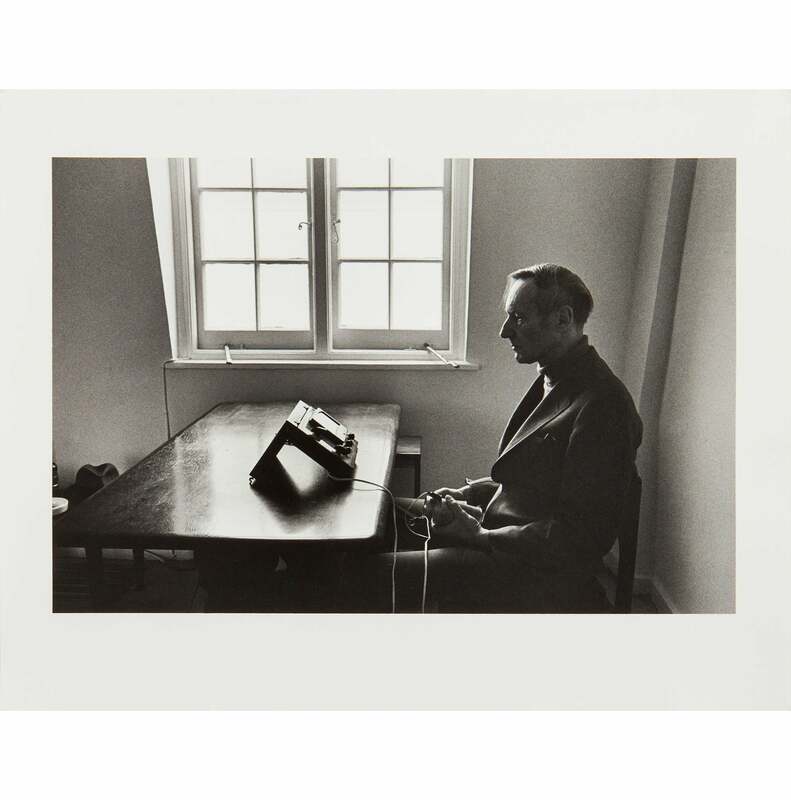 Writer William Burroughs came along, was involved, did the Clearing Course then, upon completion, when asked if he wished to sign up for OT2, said, "No thanks," and left. Then came the RPF and the RPF's RPF, and more left. By early 1977, Hubbard had written his "LSD, Years after they had Come of off' HCOB, in which he described people who had ever taken LSD as "zombies," and soon after told them that they were required to wear rubber suits and run around for hours, and more left. Then, in July 1977 came the FBI raids, and two years later came the court-ordered release of thousands of pages of secret Scientology documents, revealing much of Hubbard's secret spying and covert attack tech, and even more left. Then Hubbard decided that almost everyone was "Clear" and needed to exit Missions (which he was in the early stage of looting), and go "up lines" and spend their money there; and, while in hiding from (real and imagined) subpoena servers, Hubbard even wrote a "Common Sense Moral Code" - making him an authority on "morality" - that advised, amongst other things, against being sexually promiscuous so as to avoid having "ground glass in the soup," and more people left. This was followed, a few years later, by Hubbard responding to the Mission Holders Meeting of late 1981 by sending his #1 henchman, David Miscavige, to "handle" the next Mission Holders meeting of late 1982, and more left. Then, roughly around that time, came the partial unearthing of Hubbard's past by way of the "Shannon documents," obtained through the Freedom of Information act (by a curious non-Scientologist), and more left. By July 1984, there was Gerry Armstrong vs. Church of Scientology, and the further unearthing of Hubbard's past, and even more left. Then came books like 'Messiah or Madman?' and 'Barefaced Messiah', and many more left. Ha, maybe it's all an illusion anyway! I think there are more ways to go - someone could not review it and dwell in falsehoods and pain and judgements; take to drugs or alcohol; sink into apathy and give up on any spiritual search; do it all again in another 'cult'; take up orthodox religion; etc. Life offers us many choices in every moment.